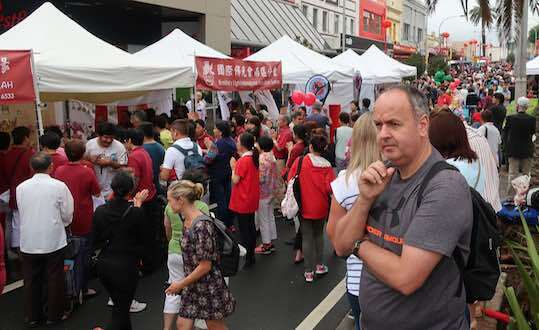 It is Chinese New Year, and last Saturday we visited the celebrations at Hurstville, the suburb where we both grew up and now home to a large Chinese community. We watched the parade and checked out the stalls, and found plenty to interest us. The origins of this festival go back millennia and are based on a legendary story of villagers learning to frighten away a giant beast who used to terrorise the village. They found that loud noises and the colour red were effective in frightening the monster. So to begin the new year well, dragon dances (which are thought to bring good luck), lots of noise, plenty of the colour red and good food all feature in the celebrations. Many of the stalls that line the route of the parade sell food, while many others advertise various business, wellbeing and religious groups. While waiting for the parade to start, I noticed a crowd at a Buddhist stall, following a priest in chanting. It got me thinking. My knowledge of Buddhism is only rudimentary, so I went home and did some research. You can see a summary of what I found in a new page, Buddhism. The Buddha was a historical character who lived about two and a half millennia ago. To cope with the suffering he saw and experienced in life, and based on a time of enlightenment, he formulated a set of rules, procedures, understandings and disciplines that would, he believed, enable followers to eliminate the craving or desire which he thought was the cause of the suffering, become more detached from the suffering and impermanence of the world, live a more fulfilled life, and become enlightened and so escape the cycle of rebirth which he believed was the lot of all of us until we are enlightened. Following the Buddha’s teachings strictly required self discipline, renunciation of many of life’s more material pleasures and following a rigorous regime of meditation and mindfulness. Many of the most serious Buddhists, both then and now, become monks so they can devote much of their waking hours to meditation and discipline. In the 25 centuries since the Buddha lived, his teachings have been modified and developed in many ways. In some countries in the east, notably China, Buddhism has been mixed with Confucianism, Taoism and folk religion in a way that loses much of the Buddha’s teachings. Chanting and good luck seem to have, partly or mostly, replaced meditation, discipline and renunciation of craving. And so, I’m guessing, older people still consider themselves Buddhists without following the stringent lifestyle the Buddha said was necessary, and are happy to mix chants with superstitions. In the west, the Buddha’s teachings have often been modified to suit western and scientific sensibilities. There is less emphasis on enlightenment and rebirth, which modern westerners would generally feel lacked an evidential reason to believe them, and a greater focus on meditation and mindfulness to achieve a more peaceful and fulfilled life. It seems a similar process has happened within christianity. Jesus’ teachings were also strong and demanding, albeit in different ways to the Buddha. He said his followers had to be willing to die to self and make following him and learning from him their highest priority. He warned his followers to be very wary of wealth, because we cannot serve God and money. And he required a high level of loving service which involved a strong ethic of forgiveness, even forgiveness and love towards enemies. For Jesus, love for God should be expressed primarily in loving actions, not so much in words and worship. Yet modern christianity ignores a lot of this, in two different ways. Some forms of christianity are built on rituals of worship and devotion. In more traditional churches these are based on large cathedrals, choirs, robed priests, incense, candles and liturgy that are meaningful to many but seem to obscure the historical Jesus. At the other extreme is the exuberant praise and worship of the Pentecostals which focuses on a cosmic Jesus and not the Jesus of history. The other major form of modern christianity is found in evangelical Protestant churches. The Jesus these churches believe in is happy for his followers to be wealthy and ignore his ethical teachings on love for enemies and giving to the poor, and instead invest their time in sitting passively in church listening to sermons they hardly remember, putting their donations in the plate and holding on to the ticket to heaven they received when they “gave their lives to Jesus”. The historians tell us that Jesus would have been seen by the people of his day as an apocalyptic prophet, a dynamic teacher and healer who gave stern and exacting commands to his followers who were part of God’s radical kingdom of grace, renewal, peace and love on earth. As a christian, I believe he was more than that, I believe he was the divine son of God, but he certainly wasn’t less than that. Yet you wouldn’t know that Jesus if you attended most christian churches today, or observed most christians today – myself included, I must admit. Is it all bad? Is it inevitable? 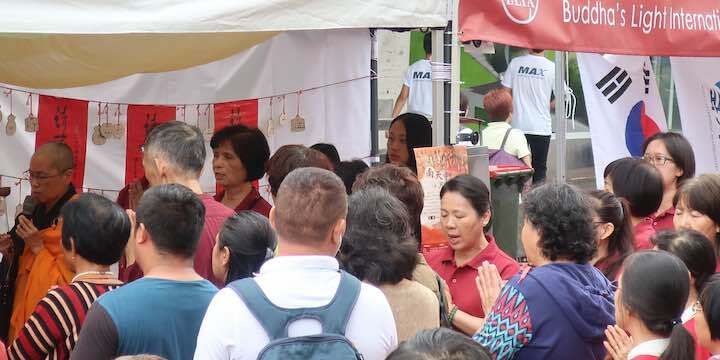 So watching the Chinese people joining in their chants with the Buddhist monk, and thinking about my own life and church experience, led me to wondering. Is this process of modernising and making more acceptable an inevitable outcome? And is it bad? Perhaps the Buddha and Jesus used hyperbole to emphasise their points. Perhaps they never expected their followers to live up to the ideal, but wanted them to at least try. But I feel sure neither the Buddha nor Jesus wanted us to take it easy and just coast along with Buddhism Lite and Christianity Lite. We shouldn’t totally judge either religion by their modern forms. 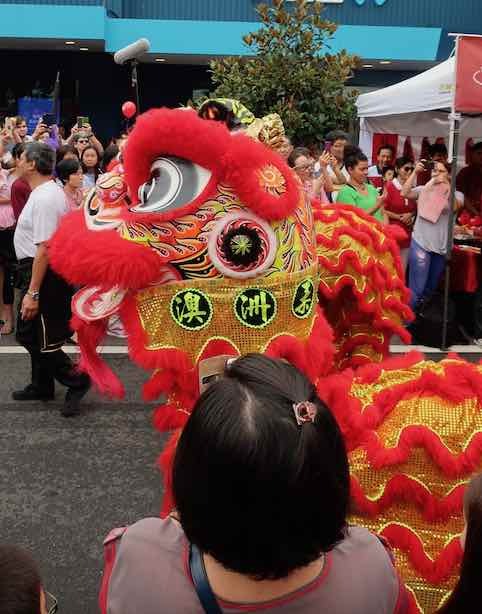 Photos: The Chinese New Year festival at Hurstville in Sydney, Australia.